I look forward to participating in Photo Friday over at A Rosy Note every week. She always challenges us with something fun to capture. This week our inspiration is “White”. For this color loving girl this really was something of a challenge. As usual, I first turned to the garden as a starting point. 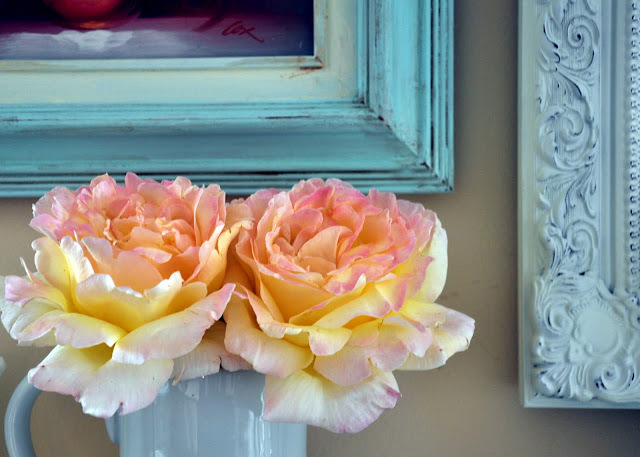 I cut this beautiful spray of soft pink and yellow roses and immediately knew they would look lovely on the fireplace in one of my hodgepodge of white pitchers. My youngest daughter, who never notices anything, (I tease her that if a man dressed as Santa robbed a bank she couldn’t pick him out of a police line-up) commented on the vase of pretty flowers asking where they came from. My garden, silly girl…my garden. I'm also joining I love pretty little things for Friday Pretties. 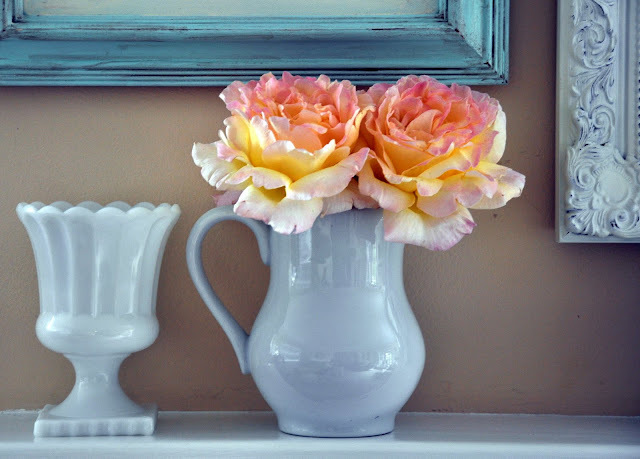 I love that little pitcher and those roses are gorgeous. Great photos. Love the blue jug, Love the painting. I love everything really. Beautiful photos. I'm over from A Rosy Note to say how pretty your photos are. 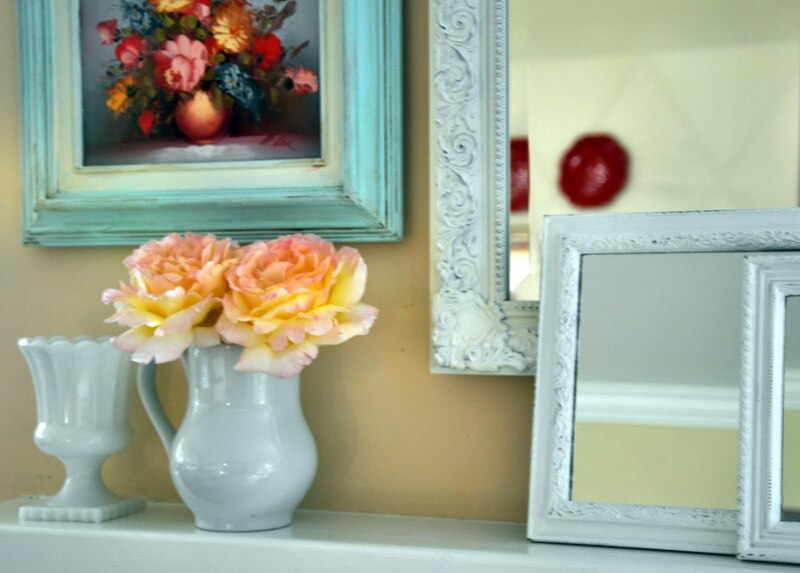 Your roses are so lovely and I love the blue frame with the white pitcher and frames. New follower. Your roses are breathtaking! I am so glad I joined this week and have found so many wonderful blogs. I hope you will stop by and visit me. Have a great day! Those roses...so Pretty!!! Thank you for sharing these gorgeous photos with us for Friday Pretties. So pretty! The roses are gorgeous! They look so good in this setting. Oh this is just stunning..so pretty!...Your roses are wonderful...can almost smell them all the way here! Thanks for sharing this beautiful image. Such amazing photos of amazing subjects. What beautiful photographs and your blog is wonderful! I am a new follower, and I am off to read more! Very beautiful! Me? I LOVE white! Love its brightness and love that every color seems to work with white. Those roses are just lovely and so big! These are beautiful! That yellow/orange color is one of my very favorites for flowers! Absolutely beautiful!!! And your photographs are wonderful! So pretty, and I love the colors of the roses...and the frames! 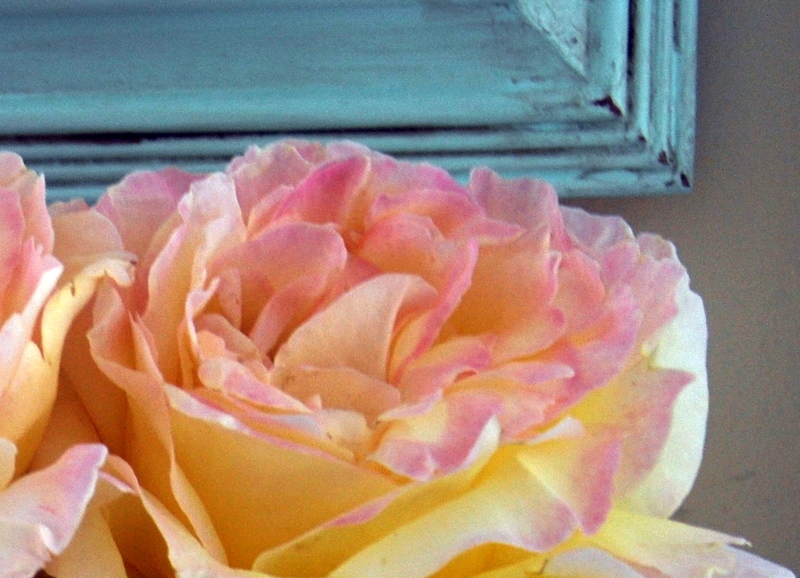 Such blissfully beautiful roses - and your photos are gorgeous - I love the frames, so pretty. Hope you're having a lovely weekend.